You can use ODS statements, the DATA step, and PROC TEMPLATE to modify the appearance of your displayed tables or to display results in forms that are not directly produced by any procedure. The following example, similar to that given in Olinger and Tobias (1998), runs an analysis with PROC GLM. This example has several parts. It creates output data sets with the ODS OUTPUT statement, combines and manipulates those data sets, displays the results by using a standard SAS template, modifies a template by using PROC TEMPLATE, and displays the output data sets by using the modified template. Each step works toward the final goal of taking multiple tables and creating a custom display of those tables in a way that cannot be done directly by PROC GLM. The data set comes from a preclinical drug experiment (Cole and Grizzle, 1966). 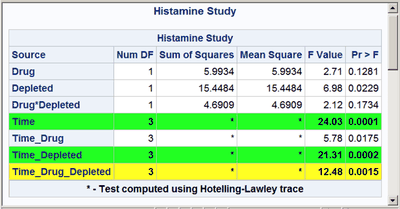 In order to study the effect of two different drugs on histamine levels in the blood, researchers administer the drugs to 13 animals and measure the levels of histamine in the animals’ blood after 0, 1, 3, and 5 minutes. 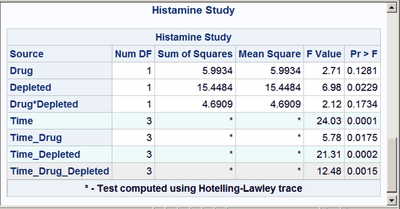 The response variable is the logarithm of the histamine level. In the analysis that follows, PROC GLM is used to perform a repeated measures analysis, naming the drug and depletion status as between-subject factors in the MODEL statement and naming post-administration measurement time as the within-subject factor. For more information about this study and its analysis, see Example 44.7 in Chapter 44: The GLM Procedure. 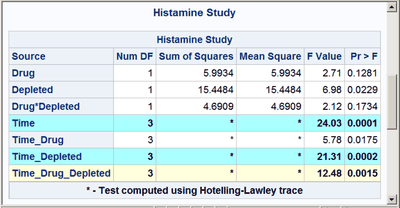 All of the multivariate test results are routed to the HistWithin data set because all multivariate test tables are named MultStat, even though they occur in different directories in the output directory hierarchy. Only the between-subject ANOVA table appears in the HistBetween data set, even though there are also other tables named ModelANOVA. ODS selects just the one specific table for the HistBetween data set because of the partial name path (BetweenSubjects.ModelANOVA) in the second specification. For more information about names and qualified path names, see the discussion in the section The ODS Statement. Wilks' Lambda 0.11097706 3 9 . Pillai's Trace 0.88902294 3 9 . Hotelling-Lawley Trace 8.01087137 3 9 . Roy's Greatest Root 8.01087137 3 9 . Wilks' Lambda 0.34155984 3 9 . Pillai's Trace 0.65844016 3 9 . Hotelling-Lawley Trace 1.92774470 3 9 . Roy's Greatest Root 1.92774470 3 9 . Wilks' Lambda 0.12339988 3 9 . Pillai's Trace 0.87660012 3 9 . Hotelling-Lawley Trace 7.10373567 3 9 . Roy's Greatest Root 7.10373567 3 9 . Wilks' Lambda 0.19383010 3 9 . Pillai's Trace 0.80616990 3 9 . Hotelling-Lawley Trace 4.15915732 3 9 . Roy's Greatest Root 4.15915732 3 9 . Drug BetweenSubjects 3 1 5.99336243 5.99336243 2.71 0.1281 . . .
Depleted BetweenSubjects 3 1 15.44840703 15.44840703 6.98 0.0229 . . .
Drug*Depleted BetweenSubjects 3 1 4.69087508 4.69087508 2.12 0.1734 . . .
Time . 3 . . 24.03 0.0001 Error SSCP Matrix Hotelling-Lawley Trace 8.01087137 9 . Time_Drug . 3 . . 5.78 0.0175 Error SSCP Matrix Hotelling-Lawley Trace 1.92774470 9 . Time_Depleted . 3 . . 21.31 0.0002 Error SSCP Matrix Hotelling-Lawley Trace 7.10373567 9 . Time_Drug_Depleted . 3 . . 12.48 0.0015 Error SSCP Matrix Hotelling-Lawley Trace 4.15915732 9 . The SGRENDER procedure displays the DATA= data set with the specified TEMPLATE= template. (You can use PROC SGRENDER to display both graphs and tables.) The results are displayed in Output 20.7.4. The results are displayed in Output 20.7.5. The results of this step are not shown. Hexadecimal values 0 through F represent the numbers 0 to 15. A hex value xy can be converted to an integer as follows: . For example, BC is . Common colors are CXFF0000 (red), CX00FF00 (green), CX0000FF (blue), CXFFFF00 (yellow, a mix of red and green), CXFF00FF (magenta, a mix of red and blue), CX00FFFF (cyan, a mix of green and blue), CXFFFFFF (white, a mix of red, green, and blue), CX000000 (black, no color), CXDDDDDD (very light gray), CX222222 (very dark gray), and so on. Colors become lighter as the RGB values increase and darker as they decrease. For example, cyan (CX00FFFF) can be lightened by increasing the red component from 00 to FF until eventually it becomes indistinguishable from white. It can be darkened by jointly decreasing the green and blue values until it becomes indistinguishable from black. The first color, CX22FF22, for the smallest p-values in the first table is a bold green color. The first table uses almost pure green and pure yellow, but a little red and blue are added to slightly lighten the colors. The second table uses a cyan and yellow that are very light due to the addition of AA (170) red and DD (221) blue, respectively. The third table uses a cyan that is not much different from light gray, and a light gray that is not much different from white.